If you are wondering whether a firestorm like the one that destroyed Paradise or Coffey Parkcould happen in the Bay Area, the answer is yes. The question is not if, but when, according to fire officials. When he was a child, there was something called a “fire season,” and it did not last all year, said Porter. Today, major wildfires can occur at any time. “There is not a single month left in the calendar that doesn’t scare me,” he said. A few days of rain do not change the underlying drought conditions: that would require a few weeks of persistent rain, which rarely happens these days. Community preparedness groups need to start training for wildfire emergencies just like they do for earthquakes, said Kelly. Following are some resources that will help you be better prepare for the next wildfire. While people who live in wildlife-urban interface (WUI) zones such as the Berkeley and Oakland hills are more at risk, ember-driven firestorms can jump across barriers and reach more urban areas as well. The more steps you take now, the better your chances of surviving and thriving after a future catastrophe. It’s important to be proactive, rather than hoping to be notified in case of a fast-moving wildfire. The best way to ensure immediate notification is to sign up for as many evacuation alert systems as possible: these include Alert SF, Alert Marin or Alameda County’s AC Alert. Cal Fire also has a Ready for Wildfire app that provides both preparation checklists and an option to receive evacuation alerts, wherever you are in the state. Twitter is another excellent source of information, especially if you follow your local fire department, sheriff’s office, and police department. It’s surprising how few people have signed up for these life-saving alerts, in a culture as tech-savvy the Bay Area, say fire officials. Fire Safe Marin has excellent resources and a very specific evacuation checklist that details what to wear in case of evacuation (long pants and sleeves; 100 percent cotton or wool); what to do inside the house (leave the lights on, turn air conditioning off); what to do outside the house (connect hoses to water spigots), and more. It is a good idea to print this list ahead of time and keep it with your evacuation supplies, so you can refer to it quickly if you have time before evacuating. Make sure you have appropriate insurance before catastrophe hits, so it’s important to take the time to shop for insurance now. A consumer-friendly nonprofit called Up Help, which does not receive funding from insurance companies, provides specific advice on purchasing adequate home insurance. The organization was formed to help level the playing field between insurers and policyholders. Up Help also offers a number of useful tools in order to collect insurance payments, should your home be damaged or destroyed. These include its Home Inventory app for phones and tablets; a detailed home inventory spreadsheet that lists every possible item in a home, to be customized by the user; and an insurance-focused evacuation check list that disaster survivors highly recommend, based on their personal experiences. “Anyone with a pre-loss inventory has a huge advantage in the recovery process,” notes Up Help. Keep these digital records at a remote location, and consider keeping valuable documents (such as passports, property titles, et cetera) at a bank or in a fire-resistant box. That way, even if your home is destroyed, you will not have lost all access to your memories. 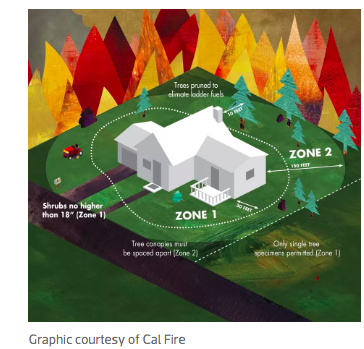 Defensible space, a buffer that homeowners are required to create on their property between buildings and the surrounding vegetation, is essential for increasing your home’s chance of surviving a wildfire, according to Cal Fire. 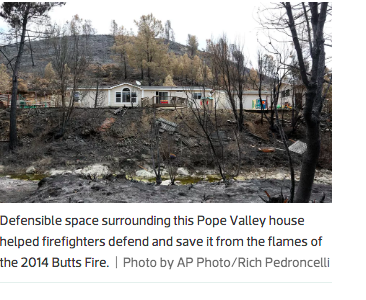 In addition to slowing the fire, defensible space helps to protect firefighters trying to save your house. 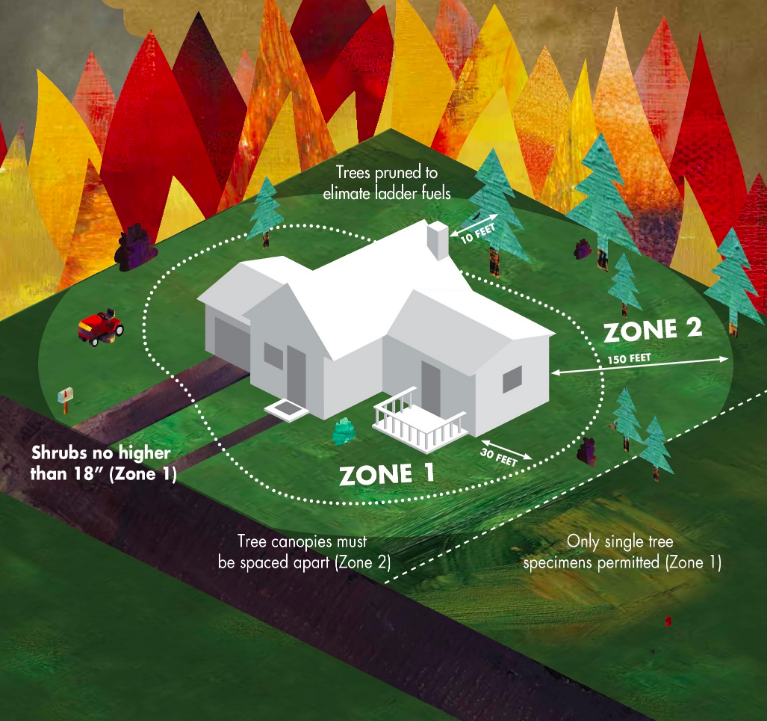 According to Cal Fire, two zones make up the required 100 feet of defensible space: Zone 1 extends 30 feet out from buildings, decks, and other structures. Zone 2 extends 70 feet beyond the end of Zone 1. In order to keep your property safe, it is important to remove all dead plants, grass, and weeds within these zones. Homeowners must also trim trees regularly to keep branches six feet off the ground, and a minimum of 10 feet from other trees, as well as keeping them away from from the roofline and chimney. It is also important to create a separation between vegetation and flammable items such as patio furniture and swing sets. Fire travels much faster over hills than flat areas, so distances need to be adjusted depending on the ground slope. In addition, whenever possible consider installing fire-resistant landscaping. 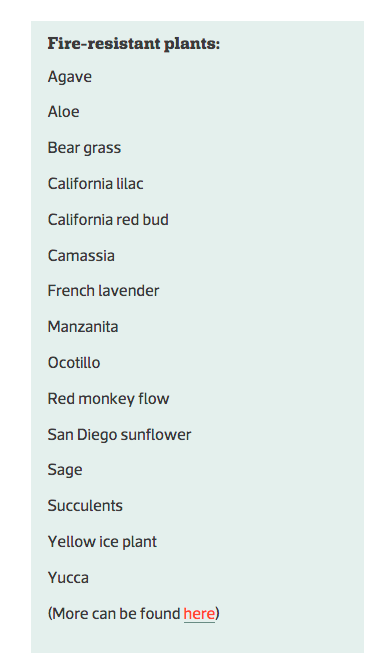 Pacific Nurseries, a wholesaler, suggests specific plants to consider with wildfires in mind. Even if you don’t want to replace an existing landscape, plants can be added and removed over time, as a garden grows and changes. Some flammable plants that should be removed from gardens include: Algerian ivy, bamboo, broom, Leyland cypress, Douglas fir, Eastern red cedar, and eucalyptus. Succulents are the most fire-resistant plants, but others are listed here. Hardscaping with paths, patios, and driveways is also important in creating a fire break. Inorganic mulches such as gravel, pebbles, and rocks are recommended, along with drip irrigation. “Hardening” (i.e., using stronger material on a home’s exterior) vulnerable parts of your house is one of the most important ways to make it fire-resistant in case of an ember-driven wildfire. This can be more expensive and time-consuming than some of the other preventive steps, but it is also one of the most necessary things homeowners can do. Vulnerable areas include roofs, vents, eaves, windows, decks, rain gutters, fences, and more. There are specific recommendations for each of these areas. Some are relatively simple and inexpensive (such covering all vent openings with 1/8- to 1/4-inch metal mesh, and removing combustible items from underneath decks.) Others, such as replacing wood or shingle roofs and installing dual-paned windows, are more expensive. “Evacuation is what keeps me up at night,” said Keith May, Berkeley’s assistant fire chief. 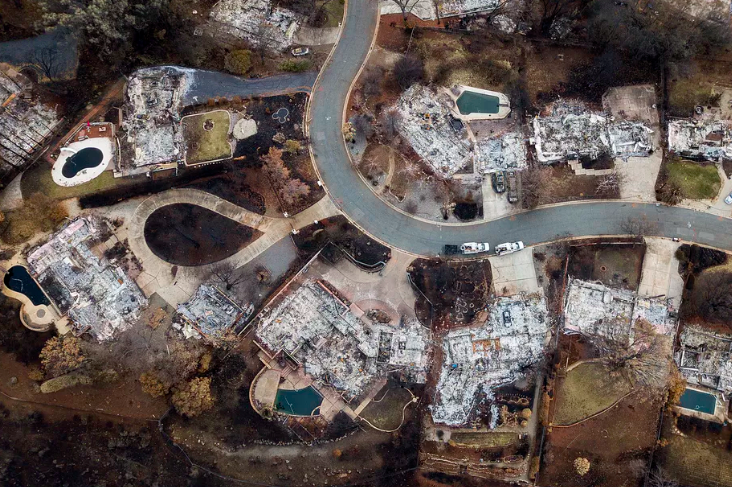 While fire departments can get ahead of fast-moving wildfires, the new “firestorms,” which create their own weather systems (such as those in Paradise and Coffey Park), are more unpredictable. 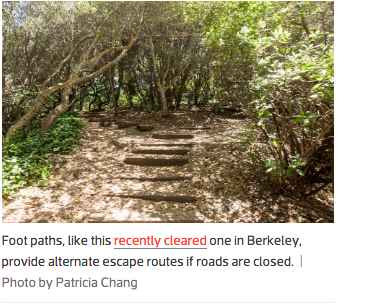 “I don’t think San Francisco would have a firestorm, but they have happened and could happen again in the Berkeley and Oakland hills,” said May, who plans to visit Paradise in the next few weeks to see what lessons can be learned..
Berkeley is now developing a new evacuation plan, which will take his findings into account. Follow instructions given by fire officials. Consider more than one escape route, because your first choice might be blocked. If time allows it, complete the evacuation checklist before leaving your house.